Carpet Beetles feed on many animal and plant substances such as wool, fur, feathers, hair, hides, silk, as well as seeds, grain, cereals, cake mixes, and flour. Other substances can include dog and cat food, leather, book bindings, dead insects, and even cotton. The larvae cause damage, crawling from room to room. They live behind baseboards and molding and in heating system air ducts, dresser drawers, carpets, clothing and furniture. 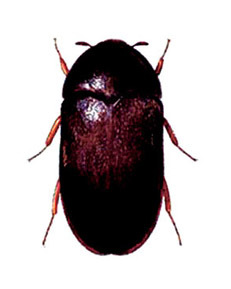 Adult beetles fly readily in May and June. They are attracted to night-lights and may enter a building through open windows or doors. Some may be brought in accidentally on cut flowers or in furniture that has been in storage or sent out for repair.